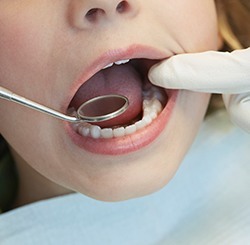 Cavity prevention is the most essential element of pediatric dentistry. Kids are very cavity-prone, and we want to help strengthen their enamel and prevent tooth decay. Twice-yearly visits for cavity prevention, including cleanings and fluoride treatments, are the foundation of preventive dentistry and are usually covered by most dental insurance plans. The American Academy of Pediatric Dentistry recommends your child’s first dental visit take place around the age of one. 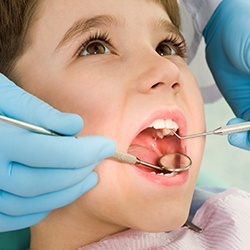 At your child’s first dental visit a thorough examination and fluoride application will be performed. 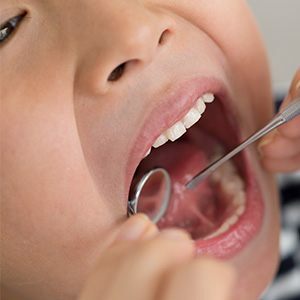 Dr. Paulson will also council you about proper nutrition for your son or daughter, discuss strategies for properly caring for his/her teeth and gums, and talk about what to expect as your child grows more teeth. Your child’s adventure to a beautiful smile will always begin with a fun-filled checkup and cleaning. As part of your child’s regular dental check-ups we’ll use a disclosing agent that shows your child where he/she is missing while brushing, help educate them about proper oral hygiene and the three B’s (Brush Before Bed), and teach them about eating a healthy diet. Plus, their hygienist will have a chance to clean off any plaque and tartar they may have accumulated since their last check-up. Appropriate dental x-rays are taken to check for tooth-decay and possible periodontal problems. 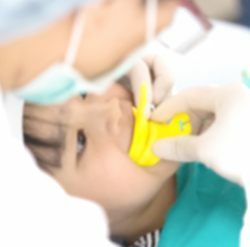 Your child’s bite (occlusion) will be closely monitored at each visit, and interceptive strategies will be recommended when needed. Also, the eruption of your child’s teeth will be assessed to ensure their proper alignment in the dental arch. 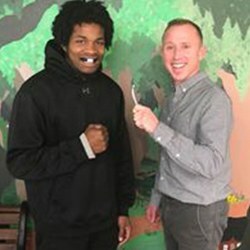 To ensure every kid leaves showing off those new pearly whites, we end every check-up with a balloon, prize, sticker, and a new toothbrush. Also, each check-up provides another opportunity to join our "No Cavity Club!" Molars – the back teeth that we chew with – are covered with grooves and crevices that are hard to keep clean. When plaque and bacteria accumulate in these crevices, it can lead to dental decay and cavities. We can help prevent cavities in these teeth with dental sealants, which are thin plastic coatings that bond into the pits and fissures of these teeth preventing the adherence of plaque and bacteria. Dental sealants are generally considered to be a vital part of any cavity prevention plan, can last for many years, and are a covered benefit of most dental insurance plans. SDF is a powerful new tool many pediatric and geriatric dentists have been using to arrest tooth decay. SDF has been clinically proven to slow the growth of certain types of cavities; but has one glaring side effect, it turns the area of the decay completely black. It is an effective treatment in slowing the rate of tooth decay and is most beneficial in delaying dental treatment in very young children (under the age of 3) who may have a high caries experience from a nighttime bottle habit and/or malformed teeth. The Paulsons tend to recommend a longer-lasting, more esthetic treatment in most children, but will recommend its use when beneficial and effective. Fluoride is a naturally occurring salt and has proven effectiveness in cavity prevention when added to toothpaste, applied topically, or ingested as a supplement. It incorporates into the crystalline structure of the tooth’s enamel and creates a stronger structure, making the tooth more resistant to bacterial attack. 6-month concentrated fluoride treatments have been proven to prevent cavities and are covered by most dental insurance providers. Community water fluoridation is considered “one of the ten greatest public health achievements of the 20th century” by the US Centers for Disease Control and Prevention. Casper’s community water is supplemented, but only to the level of 0.3 ppm (2016 WY Consumer Confidence Report). The Paulsons recommend daily fluoride supplementation for high caries risk children over the age of 4. Customize your young athlete’s grill with our selection of custom-made mouthguards (available in over 50 color schemes). Whether your child excels on the grass, hardwood, mats, or ice we can make them a mouthguard that will not only fit well and protect their teeth but will keep them looking like a savage. Also ask about our personalized mouthguards. We can personalize any mouthguard with initials, numbers, inspirational quotes, Bible verses, and/or logos; and our custom-fit mouthguards are even available in Natrona County and Kelly Walsh colors!! !